Ralph Theodore Hazell was born at Yew Tree House, The Street, on 30 July 1898. He was the middle child of William Hazell, a fisherman, and Susan née Phillips; his brother, Frederick William Phillips and sister, Dorothy Alice, completed the household. After leaving school, Ralph was apprenticed to one of the village grocers, Richard Ward. 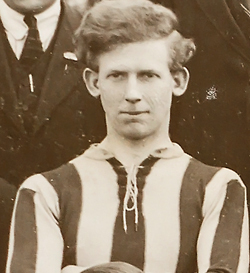 Ralph was attested for Army service at Gloucester on 3 August 1916 and was medically examined in November, but not called for duty until 14 January 1918; his records contain reference to phthisis (pulmonary tuberculosis), although a medical review concluded that the only symptom was a shortness of breath. After basic recruit training Private Ralph Hazell was posted to the Mechanical Transport Driving School of the Army Service Corps for specialist training. By 18 May he had qualified as a heavy lorry driver with a note suggesting that he had driven American Peerless trucks. On 22 September he embarked on the Maid of Orleans at Southampton, arriving at Basra to join 1115 MT Company on 6 November with only five days of the war remaining, and receiving 1s. per day war pay. On 5 February 1919 he was taken ill with colitis, requiring hospital treatment for about three months. He then served on in Mesopotamia (transport personnel are usually the last to leave any theatre) until embarking for the UK on 8 January 1920. He arrived on 19 February and was demobilised one month later. Ralph was awarded the British War Medal and Victory Medal and his service is commemorated on the plaque in the village hall. In our Gallery are several photographs of Mesopotamian scenes which Ralph brought back from his service there. After his return Ralph drove a steam lorry for Cadbury's and continued to live at Yew Tree House. On 19 June 1929 he married Vera Louise Morgan and they had a daughter, Susan. He was a superb gardener and won many prizes, particularly for his sweet peas which he would give away generously to his friends. He was a staunch teetotaller, a bell-ringer at St Mary's and at Gloucester Cathedral, and he also sang in the choir in Arlingham with his sister Dorothy. Ralph played bowls and was at one time captain of Frampton Bowls Club. It is said that he was very proud of his fine head of hair and would wash it only in rainwater heated over a primus stove! During the last few months of his life Ralph was cared for by his daughter, Susan. Ralph Theodore Hazell died at her home, Ashleigh House, The Street, on 15th July 1989 and was buried in St Mary's churchyard five days later.